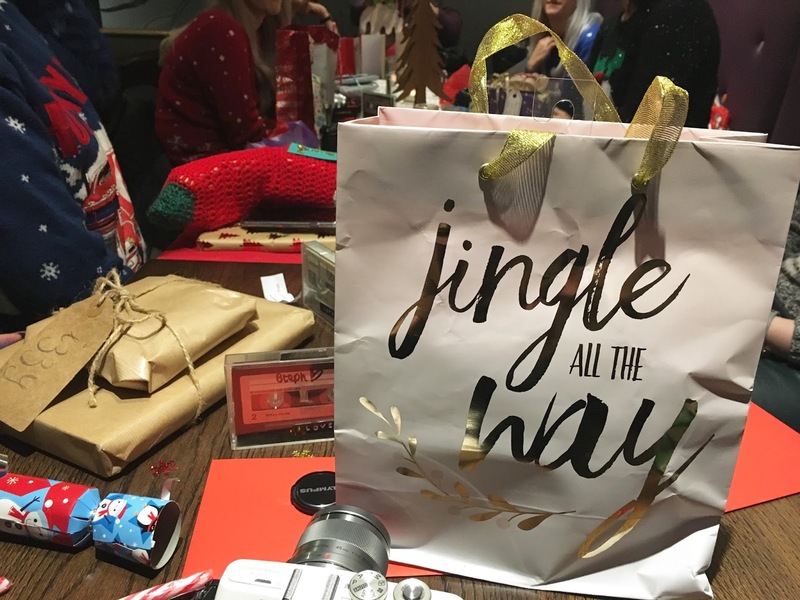 I was gutted that I couldn't attend the Christmas blogger event at Brü last year, so to bag an invite to this years was the best. 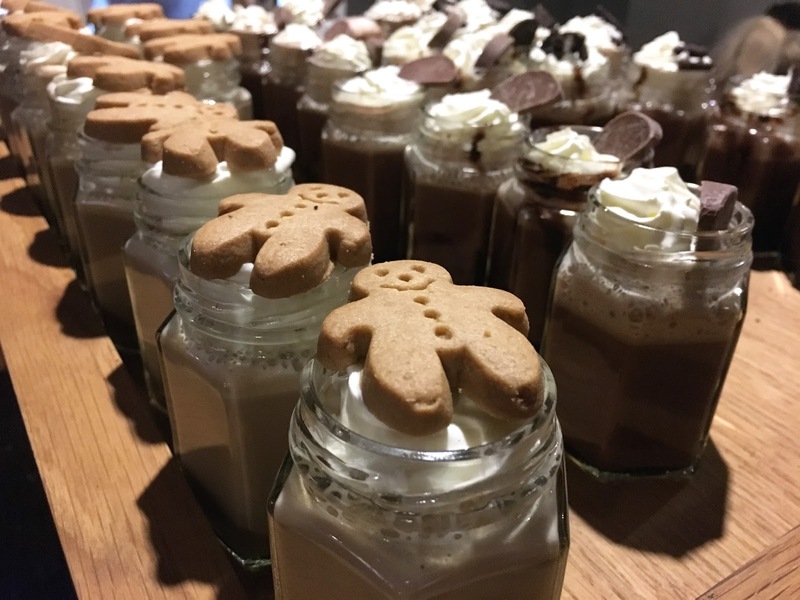 Ya'll know I love Christmas, I mean really love it, so to hear that Brü had organised another night of sampling their new festive menu got me all kinds of excited. It was such a lovely time to get together with other bloggers, chat and stuff our faces. What's not to love about that? Lots of you will know of Brü coffee & gelato and will have paid them a visit (if not shame on you!) but if not it's THE best independent coffee shop in our city that stands out against all the others. 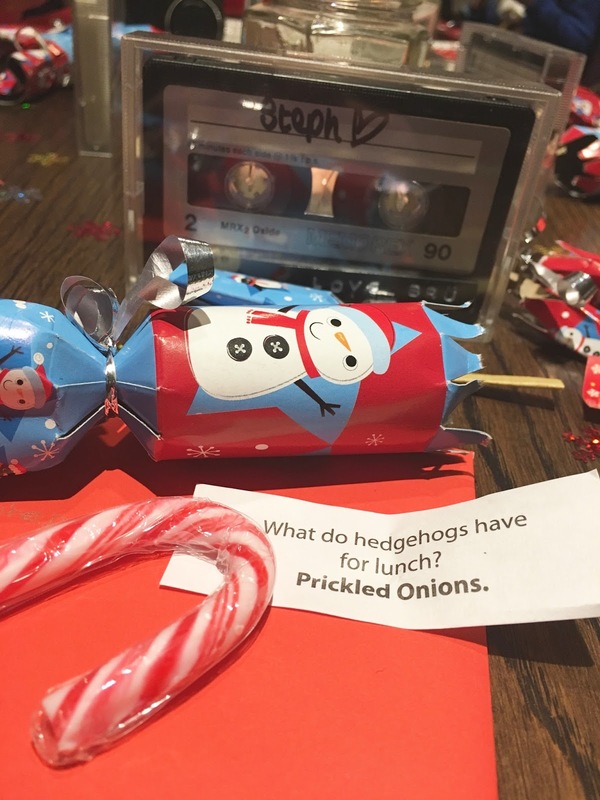 A long table had been dressed with candy canes, crackers and Christmas sparkles (how adorable are the name place cassettes?) and I'm sure the other customers thought we'd gone mad as we donned our Christmas hats, it was only 1st November! So on to the treats so generously provided by Brü and first up were the festive drinks. 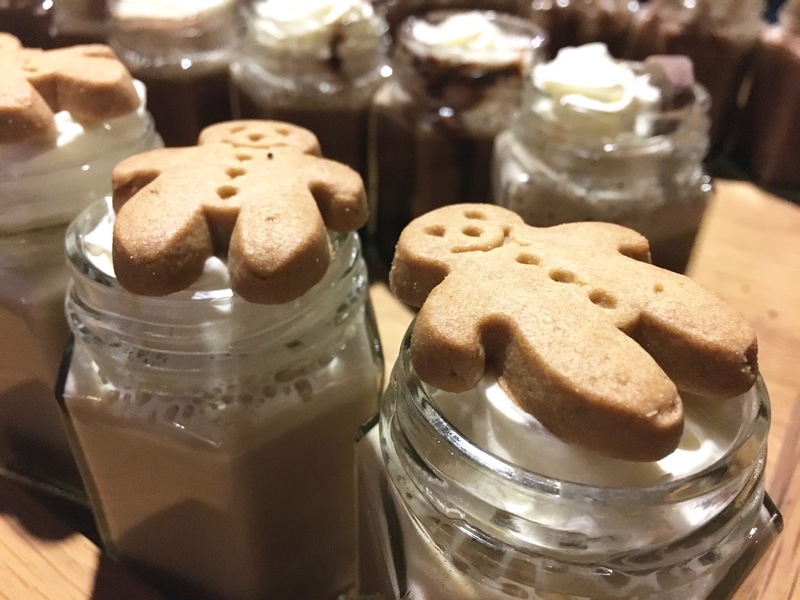 Served up in the cutest little mason jars we had a gingerbread latte, chocolate orange hot chocolate, and a cookies and cream hot chocolate. My favourite hands down was the gingerbread latte, topped off with whipped cream and a super cute little gingerbread person. Perfectly spicy and warm, great to help you through a session of Christmas shopping!! The hot chocolates were nice and of course I polished them off but I'm not the biggest hot chocolate fan, it would never be my first choice of drink, I really have to be in the mood. If I had to order a hot chocolate whilst out it would be the chocolate orange hot chocolate that comes with a full slice of Terry's chocolate orange on the top. That familiar combination is a delight and I didn't find this one too sickly like some hot chocolates. 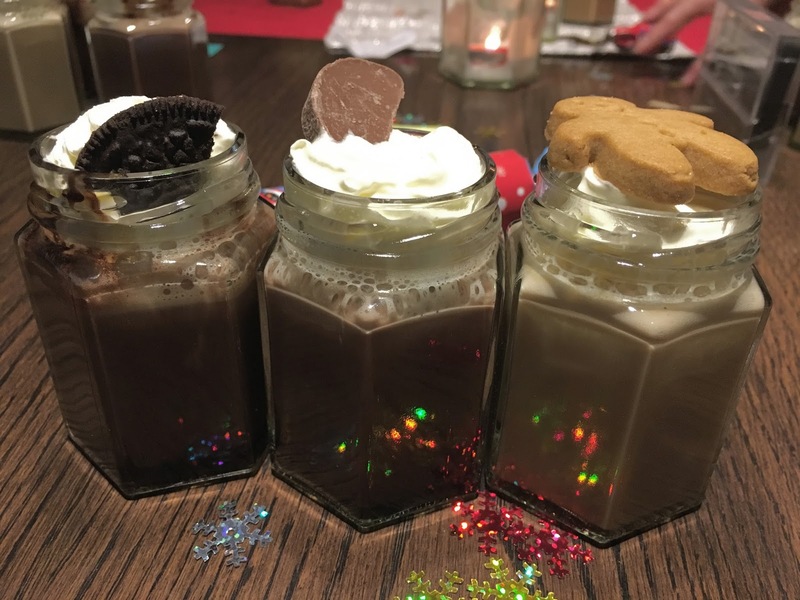 The Oreo hot chocolate is actually blended with cookies and topped off with an Oreo cookie. Although I have a sweet tooth this one was a little bit too much for me and was my least favourite of the three. I certainly wouldn't get through the regular size, I struggled to finish off the mini version! All warmed up and totally getting into the Christmas spirit, it was time for pass the parcel arranged by the lovely Emmie from Carpe Diem Emmie and Kirstie from Behind the Scent. They also arranged a little quiz and secret Santa gift giving. I received a pop up wine glass and cookies from Emmie. Anyone would think I love a drink on the go! As if. I'm ashamed to say I never got a pic of the first item put before us as I was too busy shovelling it in! You see, it was lemon tart, my ABSOLUTE favourite, I know you'll understand my excitement and let me off? Now, the lemon tart was tasty and extremely light, but I'm sad to say it didn't stand out for me. Not lemon-y enough and I like my pastry a little thicker. Don't get me wrong I enjoyed it, it just didn't stand out. Oops, didn't get a decent picture of the Cherry and Amaretti cheesecake either. Eager beaver strikes again! BAD BLOGGER. Never mind, you'll just have to go try it for yourself. I think that might have been my favourite of the evening. 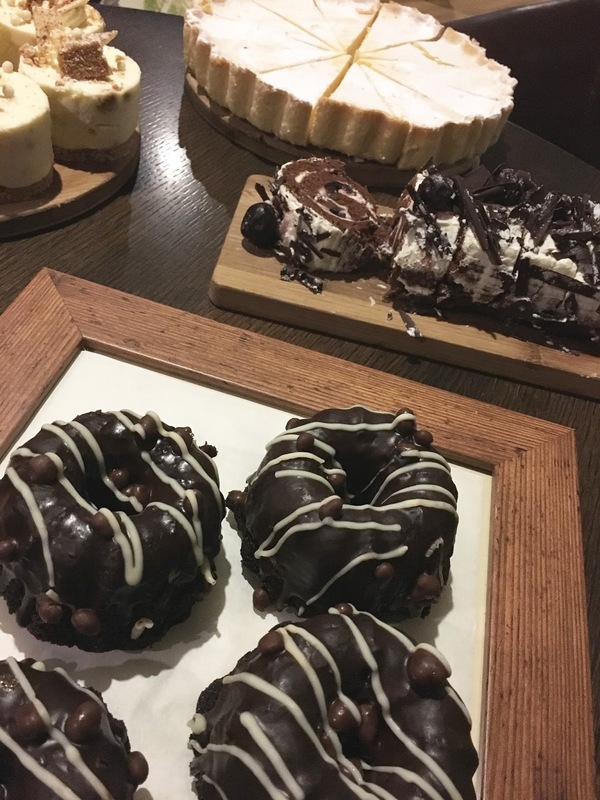 After three mini festive drinks and two large slices of cake we were getting rather full, but we had a job to do, tough as it was, we had to battle on to taste it all for you guys! These are New York style baked gingernut and vanilla cheesecakes. There was no way on this planet I was going to eat a full one so me and the gorgeous Izzy from A Dose of Chatter went halves. It tasted as delicious as it looks. Next up were the chocolate Bundt cakes. Chocolate sponge topped with a chocolate icing. They were deliciously light but satisfyingly indulgent, the way a chocolate cake should be. I wouldn't usually order any type of chocolate cake when out, I generally find them too rich and quite heavy but not this one, I'll definitely order this when I pop back in. Chloe from Brü suggested having it with a scoop of ice cream in the middle next time. Oh, go on then if I must! Last but not least was the Black forest roulade. 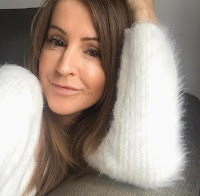 I seriously was fit to bursting and didn't have room for even a smidgen but I have it on good authority from the other girls that it was yummy with Laura from Extreme Housewifery going back for more! Although we all had a lot of fun (and games), the stars of the show were definitely the cakes, I don't think I've ever eaten so much cake in my life. The new festive menu launches at Brü tomorrow 14th November and I promise it will be some of the best cake and festive drinks you've ever had, so get yourself down there. It has such a lovely atmosphere and they're open from early morning (for breakfast) until 11pm, yep you read that right, apart from Sunday when it's 10pm, how amazing is that, perfect for that late night caffeine fix. You'll find them on Granby Street and here if you want to know more. Thanks to Brü for the invite and to Emmie and Kirstie for arranging the evening. I love love love Christmas! I'd have Christmas parties every day! Food looks amazing though. Those cheesecakes and latte's!! !